The Zipper Club returns to Camp Bravehearts for another summer of fun and feels. The comic is one with a positive focus, as it’s an adventure for kids with congenital heart defects. Something’s up with Chester Thibidoux. He’s always been the quiet member of The Zipper Club, but as a new summer at Camp Bravehearts begins, the gang has noticed him being a little quieter than usual. At every opportunity for fun, Chester just seems to stare off into the distance. The divorce of his parents back home and the absence of an old camp friend haven’t helped his sour puss demeanor, but all is not lost with The Zipper Club on the case. Here, here, Zipsketeers! 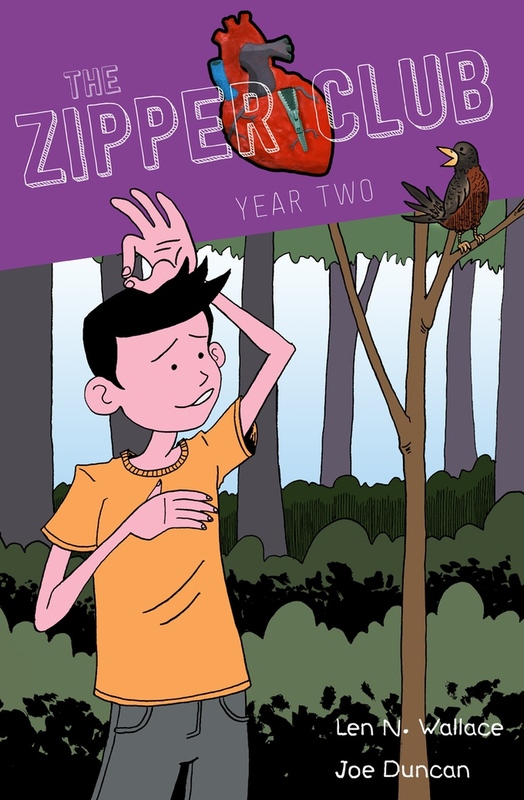 The money from this Kickstarter campaign will go towards funding a first print run for The Zipper Club – Year Two, but with the project successfully funded stretch goals are on the horizon. Creator Len N. Wallace is a life-long survivor of a congenital heart defect, which inspired him to write The Zipper Club after spending his youth fighting illness, and his teenage and adult life counseling summer camp for kids with heart defects not unlike his own. Growing up in and out of hospitals left him with a lot of time to sit and watch TV and read and he noticed a lack of characters he could relate to with his illness. After growing up and surviving to become a professional comic book writer, he teamed with artist Brenda Lopez to bring The Zipper Club to life. It’s a story designed not just for children growing up like he did, but also for kids who want to understand what it’s like to grow up and live a life designed differently. In this, the second of five year run that we hope to continue the series on, we want to tackle not just specific issues like heart health and illness, but also more universal issues that every kid may have to deal with, ranging from the divorce of parents, young love, coping with loss of a friend or family member, survivor’s guilt, all the way up to navigating the locust swarm known as puberty. As we grow up, we all gain our share of scars, be they physical and otherwise, Chester and The Gang are here to be the voice that says the things we survive are what ultimately show us what we’re really made of. Brought to life by the artwork of Brenda Lopez (TZC – Year One) and Joe Duncan (TZC – Year Two) that gives the children their own unique senses of personality while bringing a sense of fun, quirk, and youth to a tale of friendship and survival unlike any ever told before. The project runs until March 14 at 8pm EST. The Zipper Club is one of those comics that’s a rarity in the industry. It not only tells an entertaining and sweet story, but also has a goal of doing good for kids with medical issues. Based on the personal experiences of writer Len Wallace, the comic aimed at kids with heart defects, has an underlying theme that they are not alone, and there are many others with issues just like them. It’s an inclusive book that gets kids to accept what might be happening to them. The art by Brenda Liz López has a style perfect for the age the comic is aimed for. It’s cartoonish, making it easier in a way to accept what’s going on and reflects the fun nature of the comic’s story. I myself have medical issues (though different) from this one, and I wish there was something like this when I was growing up. It would have helped me relax and realize there’s others like me. This would be great for any kid going through what these kids are, especially with its focus that no matter your health issues, you should go out, have fun, and enjoy life. Indigogo Spotlight: The Zipper Club – Len Wallace Sings! We previously promoted The great Indiegogo project, The Zipper Club. Creator Len Wallace laid down a challenge that if the project raised $1000 in the first week he would sing a Taylor Swift song like Les Miserable’s Javert. Well, done and done since the goal was met. For a whole day, I will have my brother follow me with a camera and sing talk like that and then we’ll post the highlights. So, I like a challenge, lets get him there and force him to embarrass himself some more. It’s nice to be able to support a comic book that not only has a good story, but is also for a good cause. That’s why I can proudly recommend The Zipper Club, a Indiegogo crowdfunding project by comic creator Len Wallace. At age 8, Cliffy Goldfarb was the recipient of an emergency heart transplant. At age 9, Cliffy is now struggling to cope with the limitations his still recovering body is undergoing, and the fact that because of this, he has trouble relating to his peers. When his mom suggests spending his summer at Camp Bravehearts, a place for kids living with heart defects like his own, he has some trepidations about going this camp for “special” kids, but soon learns his worries were all over nothing when he meets a young girl named Rosie who introduces him to a group of new friends who encourage him by showing off their surgical scars to one another and inducting Cliffy into “The Zipper Club”. Len himself knows the subject well, he himself is a life-long survivor of a congenital heart defect and worked at a real camp that inspired the him to write the story. The series isn’t just about these kids and their heart defect, Len has plotted out a long run that will tackle issues like dealing with divorce, young love, coping with loss of a friend or family member, survivor’s guilt and even puberty. Len has shown his knack for taking on similar subjects in his Oni graphic novel, Love Buzz. Art will be provided by Brenda Liz Lopez. The money raised will go towards funding the first print run and a little towards paying for the creation. There’ll also be copies donated to pediatric cardiac care centers around the county, so it can make its way into the hands of kids who could need it. And here is even better news, a portion of any profits from the book will be donated to the American Heart Association as a way for the project to give back. Best Pledge: $15 – I’d say give as much as you can since this is a good cause, but this level gets you a digital and print copy. Risk: LOW – I know Len pretty well, and he’ll come through on this. Most of the material is done, so the creation part is good to go. The risk I see is printing issues, but he’s built in a good amount of padding for that.